The Australian rider has been unveiled as Edinburgh Monarchs’ first signing for next season’s Championship campaign. His return to Monarchs ranks will rekindle fond memories of his double league-winning spell with the club in 2014-15 where his scoring partnership with Craig Cook was hailed as one of the club’s best ever. 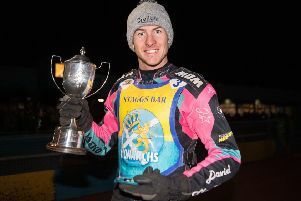 Sedgmen, winner of the Scottish Open title in 2017, said he was delighted to rejoin Monarchs. “I want to do a good job for Monarchs andd they need to get that fun atmosphere back,” he said. “Looking in from the outside it has not seemed the same over the last three years as it was in 2014 and 2015. Hopefully I can bring something to the table that helps bring that atmosphere back. “I’d like to think we can win more trophies again. That was the important thing in those two seasons, it was just so much fun and there was no pressure. Sedgmen believes Monarchs are capable of striking title gold again, recalling: “Obviously I have some very fond memories of my times with Edinburgh, they are memories you remember and it’s why I’m so excited to be part of the Monarchs team again. Sedgmen is already planning for next season. “In the year I’ve had off I have been working hard and saved as much money as I can,” he said. “I’ll be heading over around February so I have plenty of time to prepare and make sure my bikes are set up properly. “I’m going to be staying with Sam Masters again as I did when I was last with Edinburgh, I think that was a major factor why we enjoyed ourselves so much back then.